At the time of writing, true wilderness areas are a very rare thing indeed. Places where human activity hasn’t yet destroyed the natural cycles of the planet and we can remember how the world once would have looked without the scar of unsustainable civilisation. The Great Bear Rainforest in British Columbia might be as close to a pristine ecosystem as one can get. This wild land of ancient tree forests, glacial waterfalls and uninhabited islands has a humbling silence that is only punctuated by the chuffing of bears, the exhaling of whales and, if you’re lucky, the howling of coastal wolves. Exploring the impossibly green, mossy shadows of the forest floor peppered with toadstools, straight from a children’s book, is exciting in its own right. However, when you come across a daybed, dug from the earth by the giant paws of a grizzly bear, your skin will tingle as you realise that this isn’t our land; it’s the bears’. 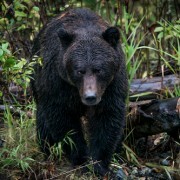 The Great Bear Rainforest stretches along Canada’s west coast from Vancouver Island all the way to south east Alaska. At 21 million acres, it’s one of the largest remaining tracts of temperate rainforest left in the world. 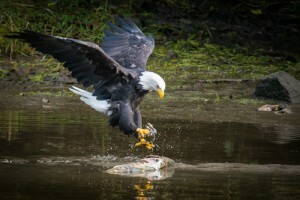 As well as having the highest concentration of bears in North America, this rainforest is home to cougars, wolves, wolverines, the American marten, mink, Sitka deer, river otters and the ever iconic bald eagle. However, the keystone species of this region is none of the above. In fact, the health and productivity of the forest is linked to an aquatic creature – Salmon. In the early autumn of each year, five species of Salmon make the marathon journey from the ocean up the endless rivers and streams to spawn. This is called the Salmon run and is one of the most dramatic natural events on earth. Upon entering the fresh water, the salmon no longer feed but have the primary goal of reproducing and protecting their fertilised eggs. Once this has been achieved, these zombie fish will then die in the gravelly river beds and their carcasses will feed the plethora of mammals and birds…..and even the trees! Scientific studies have shown that good salmon years directly correlate with wider tree rings in the forest. Early September is the best time to visit the Great Bear Rainforest if you’re looking to spot grizzly bears, black bears and spirit bears. Before their long winter hibernation, they’re in a state of hyperphagia (constant eating) to gain enough weight to survive the 5-7 months without food. 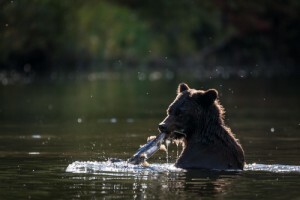 You’ll see the bears on the banks of the river or swimming to take advantage of the salmon feast that has arrived in their home. It’s interesting to watch that, because there is so much food, the bears are very selective about the parts of the fish that they eat. They concentrate on devouring eggs, skin and brains that are particularly fatty and nutritious. Distinguishing grizzly bears from black bears isn’t by colour as the name might suggest. In fact, grizzly bears can vary from blonde to nearly black. The easiest way to identify grizzly bears is that they have a hump between their shoulders which is absent in black bears. Spirit bears are very easy to identify as they are cream coloured and are actually a rare colour variant of the black bear. Grizzly bears are the slowest reproducing land mammal in North America and because of this, external factors can quickly cause their population to shrink. Therefore, it’s almost impossible to comprehend that the government of British Columbia still allows trophy hunting of these majestic creatures. Each spring and autumn, hunters set out with the objective of shooting a big male bear for no other reason than to hang on their wall (you can’t eat the meat). Economically trophy hunting doesn’t make sense either. 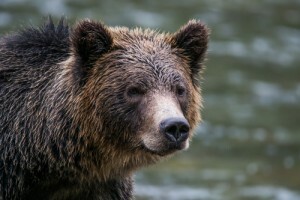 A grizzly bear is more valuable alive (for ecotourists to watch and photograph) than dead. If, like me, you’re passionate about stopping trophy hunting, you can donate money to Pacific Wild via the button below. Being a wilderness area, travelling in British Columbia isn’t particularly easy or cheap (but absolutely worth it). The lack of roads through the forest means that, from Vancouver, the best way to get around is by air or water. You can find accommodation in luxury lodges miles from anywhere with abundant wildlife right on their doorstep. I stayed at three different luxury lodges which were all uniquely wonderful. Tweedsmuir Park Lodge is a non-coastal lodge which specializes in grizzly bear viewing from drift boats (meaning that you can get pretty close). Nimmo Bay Wilderness Resort is a floating lodge with fantastic whale watching opportunities. Whilst staying with them, I saw a Steller sea lion rookery, harbour seals, orca, humpback whales, Pacific white-sided dolphins and Dall’s porpoises. Finally, I stayed at the Great Bear Lodge which is a fantastic place to photograph grizzlies if you’re a keen photographer. I could write a whole other article about how amazing the staff and food were at each of these lodges but I must stick to the wildlife! Thank you to Mantis Collection and HelloBC for making this eco-adventure possible.